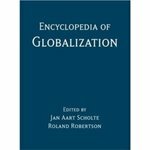 "Encyclopedia of Globalization" by Roland Robertson, Jan Aart Scholte et al. David Downie is a contributing author, "Persistent Organic Pollutants". Book description: The Encyclopedia of Globalization provides a thorough understanding of the theoretical underpinnings of globalization as well as the various historical and analytical interpretations. Consisting of over 400 entries, coverage includes key cultural, ecological, economic, geographical, historical, political, psychological and social aspects of globalization. David Downie. “Persistent Organic Pollutants.” In Roland Robertson and Jan Aart Scholte eds., Encyclopedia of Globalization. 4 Volume Set. New York: Routledge, Taylor & Francis Group, 2006. Robertson, Roland; Aart Scholte, Jan; and Downie, David Leonard, "Encyclopedia of Globalization" (2006). Politics Faculty Book and Media Gallery. 19.